During summer, Chinese love to do stuff outside in the streets, parks, squares - or in this case even beneath a road overpass near our home. Wherever there`s enough space for a bigger bunch of people, because Chinese also like to do this stuff in a group, the bigger, the more, the better. And there has to be room for potential spectators,too. It´s really one of the things I love about China - the social life is far more public and open. Whenever you walk, drive or ride through the city, at each corner you`ll find a group of Chinese playing, practicing or performing something. And to find out what you often have to get through a ring of spectators to find out. Makes moving through the city very interesting and exciting. Well, what is that Chinese do in the streets? Or under the bridge? Don`t like fan dance? No problem - just cross a road and choose something else. How about a little dance with little drums? Or no Chinese folky dance at all? No problem. What about ordinary, good old-fashioned aerobics? Or no sports at all? How about a game of cards or Chinese chess with dozens of spectators commenting your every move? There are plenty more activities. And I haven`t even started on the food stalls yet. But I hope it´s enough for starters to get the picture - in summer, in China fun is open air. Where better NOT to park your car in Shenyang. If the world would come to an end, it would probably be wet. Last weekend we had one of the worst thunderstorms in years or even ever - at least that`s what several colleagues and students told us, and they should now, as some of them live here their whole life already. 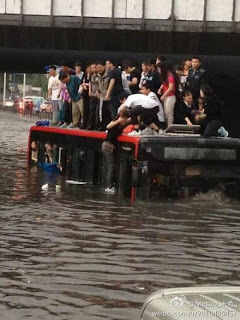 It really had the darkest sky, the strongest winds and the heaviest rains I´ve ever experienced in China so far that day. Of course we stayed home, but could see the road from our window, people being unable to hold their umbrellas up or keep on their scooters or bicycles due to the wind, and wade or drive through knee-deep water on the road. 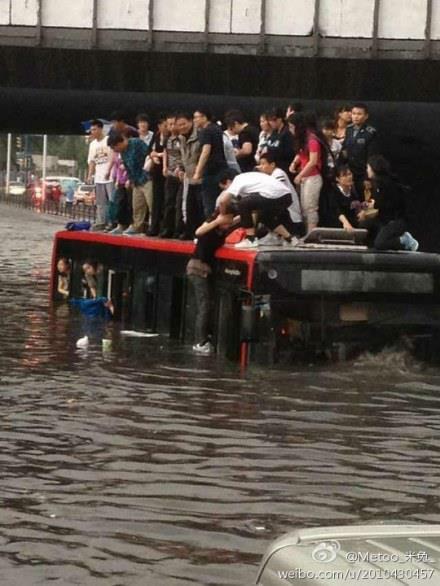 On some underpasses the water level obviously was far more critical, as you can see on the picture, taken by a friend not that far away from our apartment and put on weibo. We even heard a person drowned during the rain. Our condolences.